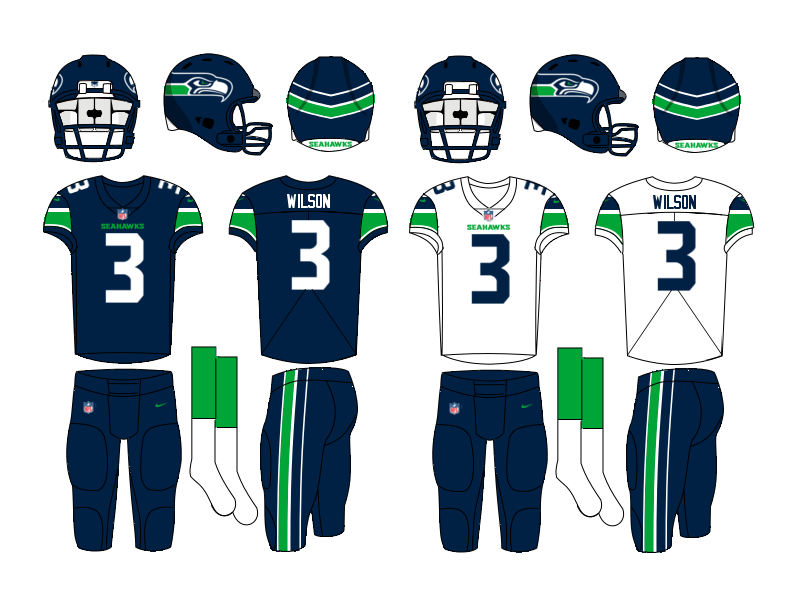 Somehow I want extra white outlines on the navy jersey cuff to match the pants stripes. Maybe just around the seams? I agree, but think it should go a step further. White sleeve cuffs and a white stripe over the blue shoulder stripe. Well, welcome to Sacksonville. I didn't touch the logo but I did come up with a new wordmark to accompany the new uniforms. 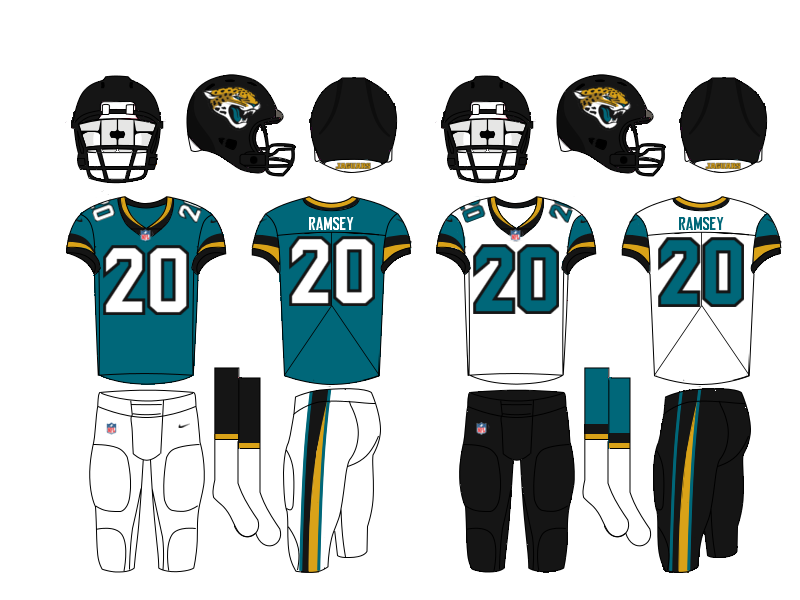 The uniforms are kind of a modernization of the classic Jaguars uniforms. Obviously, the horrendous half & half helmet is gone and the uniforms move back to a more traditional football uniform. The traditional striping pattern has been replaced with tapered, pointed stripes and the new number font is a block font with some contemporary touches. Teal is now the home uniform again because, come on, its just the way it should be. White pants are the primary home pants and black is the color of the primary road pants, but they could be worn interchangeably. I love the color balance that teal numbers give the white jersey the perfect color balance. 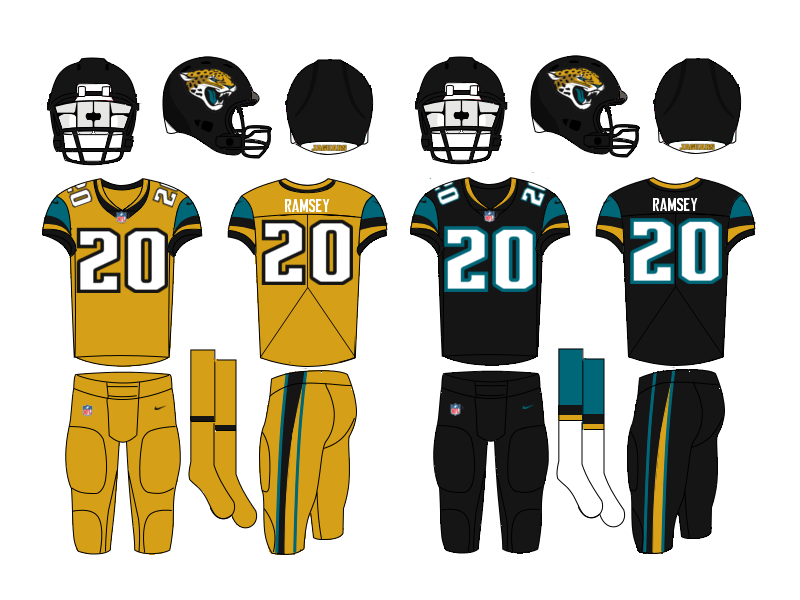 I'll be honest, I didn't hate the idea of a gold Color Rush uniform for the Jags, but I didn't care for the previous design or the fact that the gold uniform was entirely devoid of teal except for the number outline. 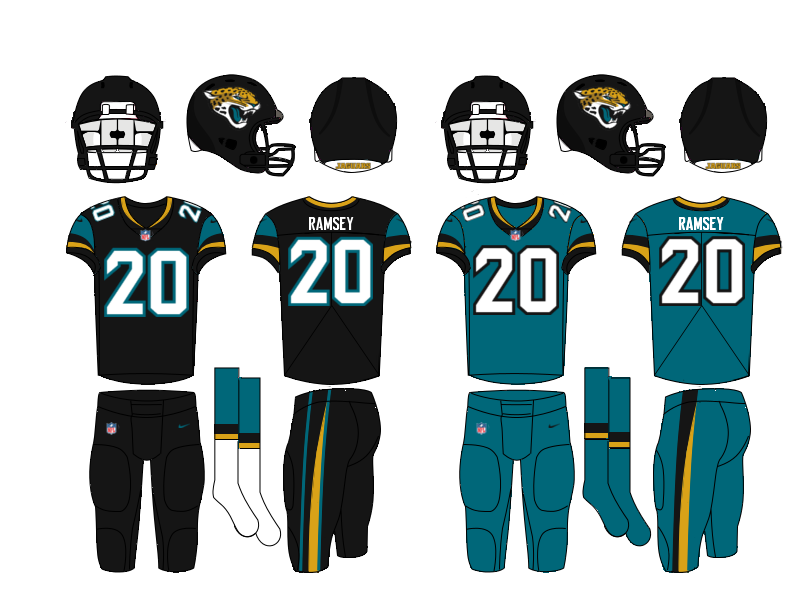 The alternate jersey is black with teal sleeves and I went ahead and paired it with black pants, because, lets face it, that's how it would probably worn and I'm not opposed to the occasional monochrome uniform as long as its worn with contrasting socks. Here's an update to Seattle. I added a white outline to the sleeve stripes to mimic the helmet logo and pants stripes and I think it was the right call. Thanks for the input. Seattle is better with the updated striping. 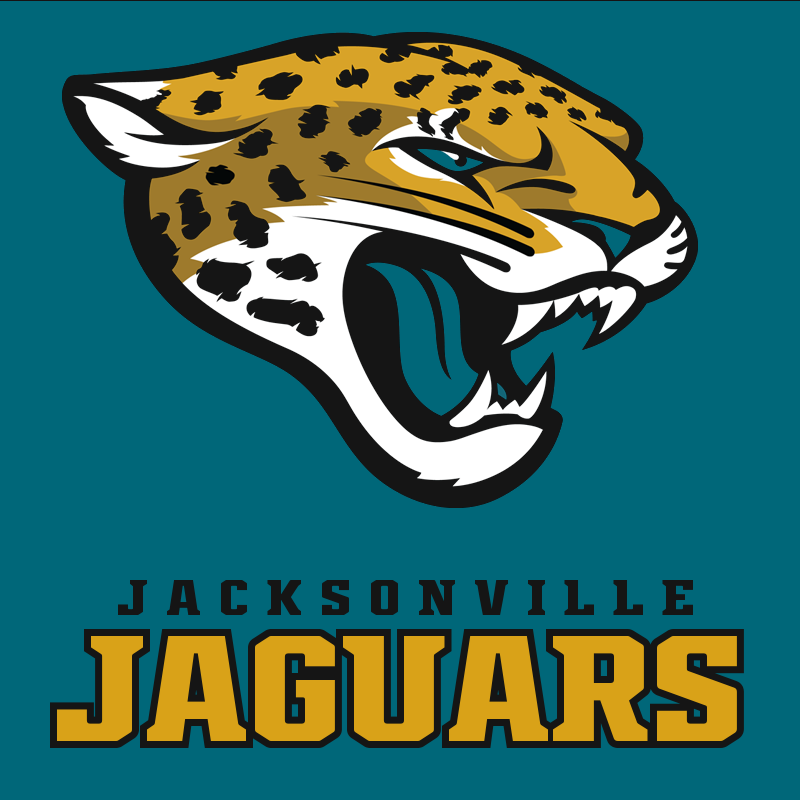 Maybe it's just my screen if I'm wrong, but is there no gold outlines on the numbers in your Jacksonville concept? I think that not using the inner gold outline and a similar one in teal on the gold uni would be a mistake. Kinda curious why you left the teal upper off of the white jersey. It's on the gold and black versions. Minor detail though. I really like the way the Jags turned out. The diagonal stripe on the pants has a good feel to it. Can't think of a specific way that it works but it just feels right. I left the sleeve caps off because it just didn't feel right, might revisit that though because there are some details I'm not too happy with after letting them sink in a little bit. I agree about the pants stripe. There's jus aomething about it that works and I really like it. Thanks for the comment. 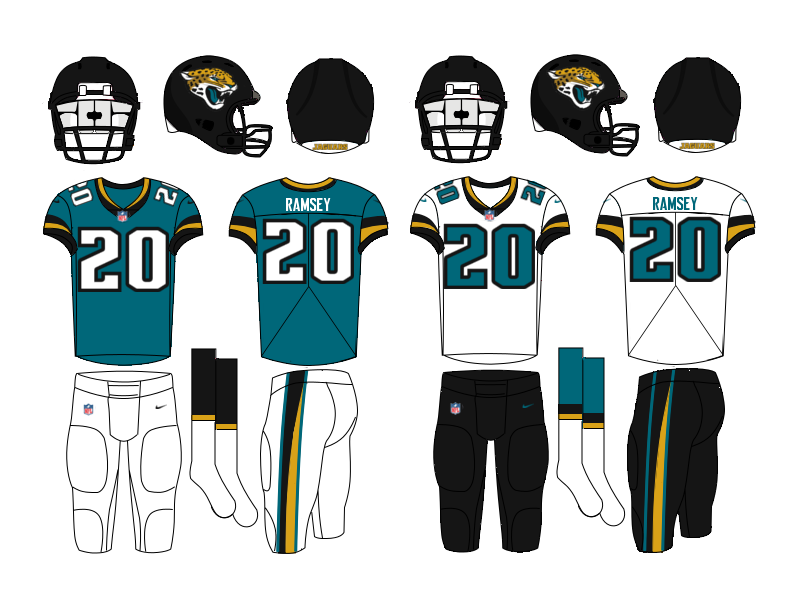 I really like how the jaguars jerseys turned out, however I think the current font would be a better choice. I also love the thick number outline and the collar and sleeve stripes design. Maybe add teal pants? This one was tough, I had originally planned on going back to the Bucs old logo, which I have always been a fan of, but it has really started to look dated lately. I am not a fan of the new logo, especially the way the skull and swords interact with the flag. So, I kind of created a zombie logo, keeping the general shape of the new flag and sword, but ditching black using a simpler skull and swords on the flag, more reminiscent of a real jolly roger flag. The uniforms proved to be a little tougher to design than I anticipated. My instinct was to keep going back to the original pewter and red uniforms, but I didn't want to just retread a classic. 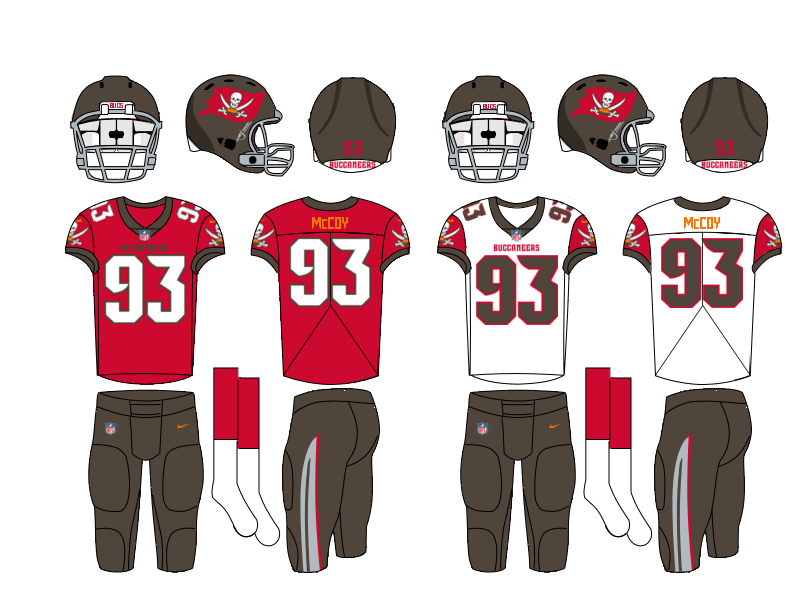 The home uniform is the classic Bucs look, with a pewter helmet, red jersey and pewter pants. It was tough to integrate the bright orange into the uniforms, so I used it as the Nike swooshes and player names. I'm not 100% happy with that and I'm not sure it doesn't feel forced. Instead of the pirate ship logo, which doesn't fit on a sleeve very well, I use the skull and swords form the primary logo, which is always on a red background, as it would appear on the flag. The road uniform is a bit of a departure, with red sleeve caps and pewter numbers. 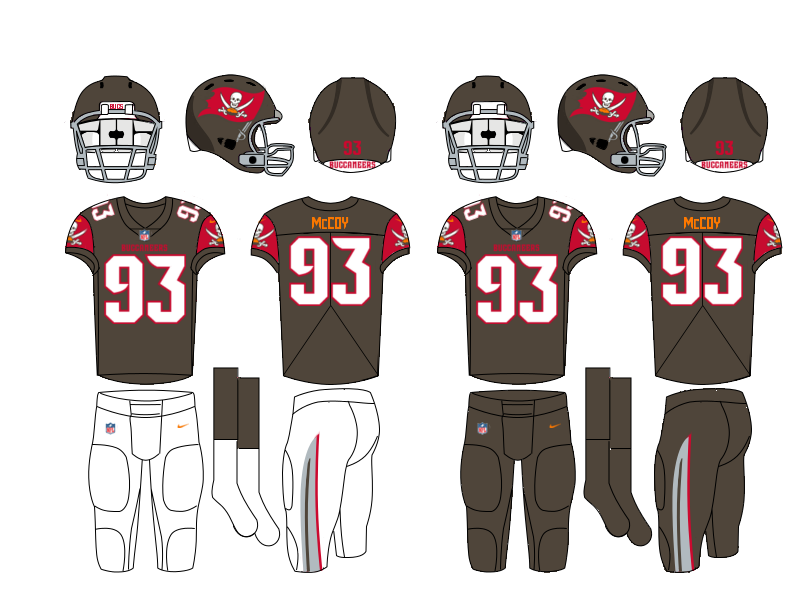 I've always wanted to see Tampa Bay in a pewter jersey, so I added a pewter alternate jersey with white pants. Originally, I had planned to use a creamsicle look for the Color Rush uniform, but I couldn't get it to look right with this uniform set, so the Color Rush is head-to-toe pewter. Thanks for having a look and I look forward to hearing what everyone has to say. Skull looks... not menacing enough, too happy, and just off, it’s hard to explain. I wasn't really a huge fan of most of the changes, beyond the Northwestern Stripes and elimination of black, the Lions made with their latest uniform update. I never liked the wispy italic number font, ugly wordmark, dark gray trim and Color Rush uniform, or the sleeve wordmark and memorial logo. 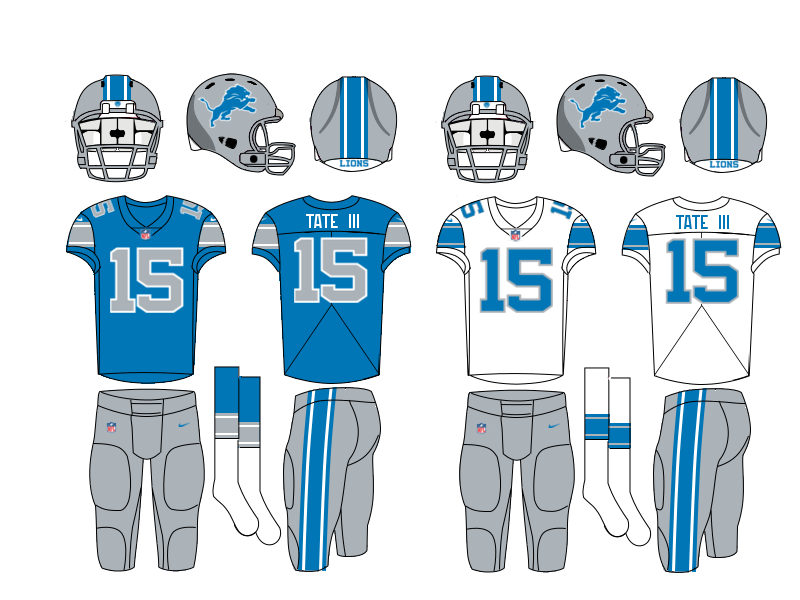 Honolulu blue and silver need either black or white to work well as a color scheme, IMO, so I added white trim to the stripes and numbers for the Lions. The new numbers and wordmark are strong block font to give the Lions the old-school feel they should have. The Thanksgiving throwback is essentially the same and the Color Rush uniform is just a gray version of the home and road uniforms. 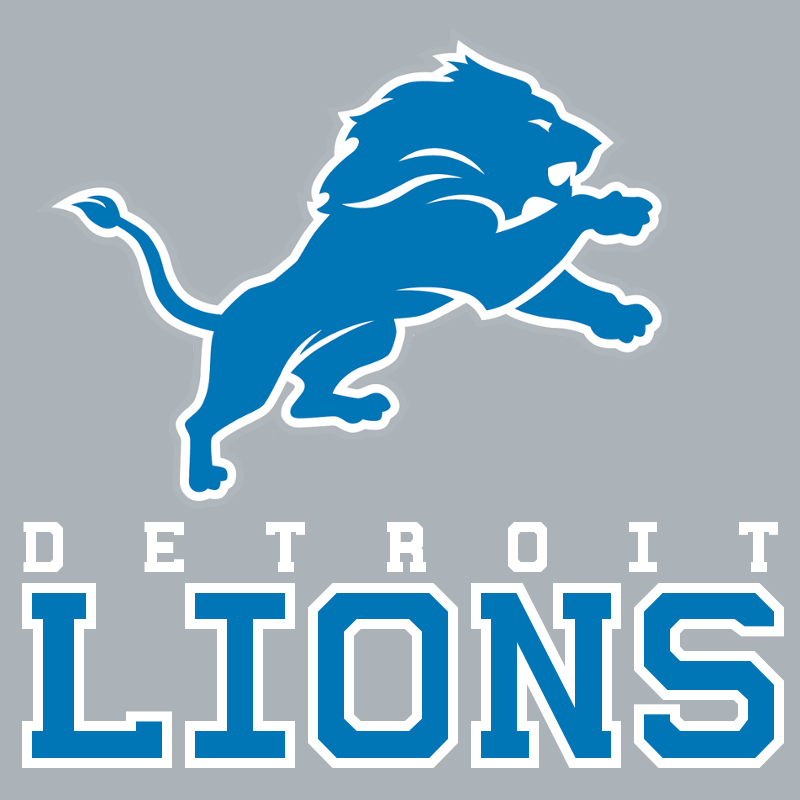 It't pretty straightforward and basic, but that's the way the Detroit Lions should look if you ask me. Anyway, thanks for taking a look. Lions are pretty much perfect. The addition of white in between the big blocks of blue on the helmet is something I wish the Lions would actually go with. 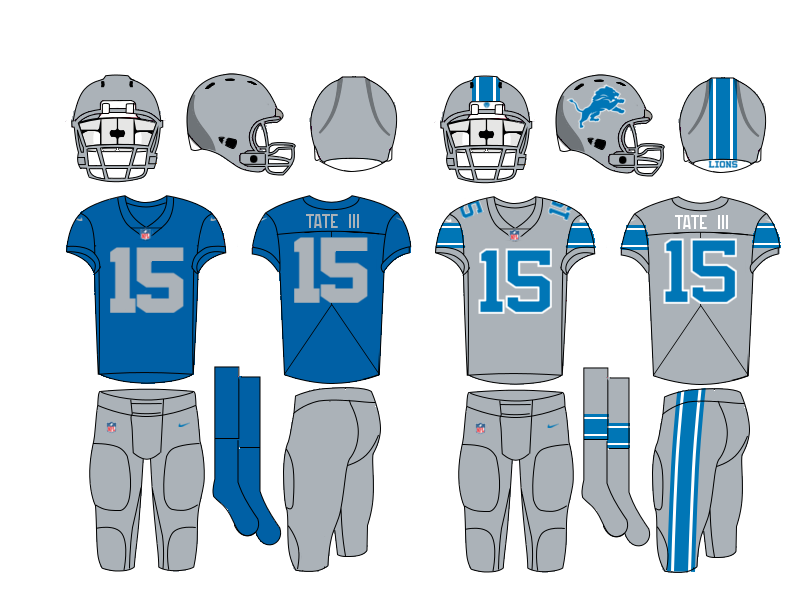 Yeah one of my biggest gripes with the Lions uniforms is the lack of contrast between the blue and silver. The stripes need white like the logo has. Lions are perfect, great job. Jags are nearly perfect, I still think that you should have a gold trim inside the numbers, but besides that, no complaints. 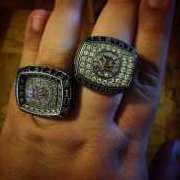 Bucs..... I think that adding an inner orange trim to the numbers and switching the color of the road white numbers to red trimmed in pewter, it will be amazing. 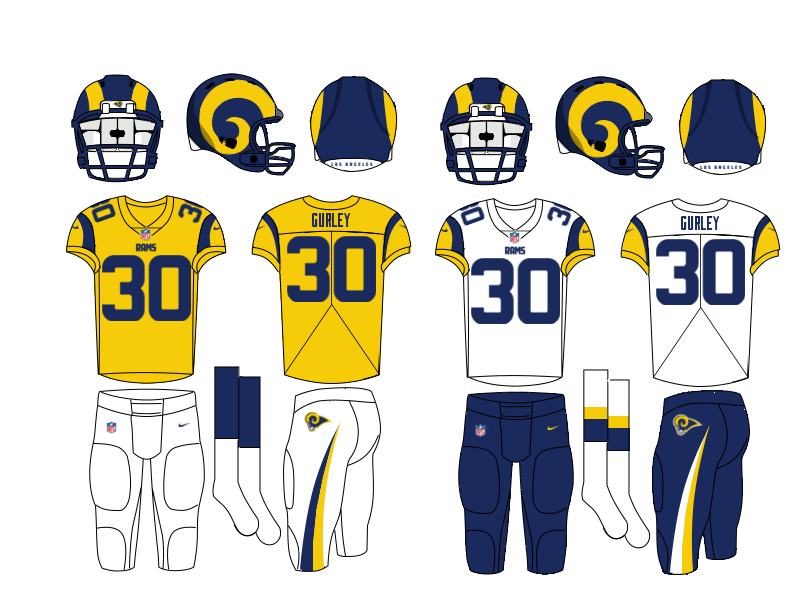 I know this is your standard Rams concept, but it's just sooo good. 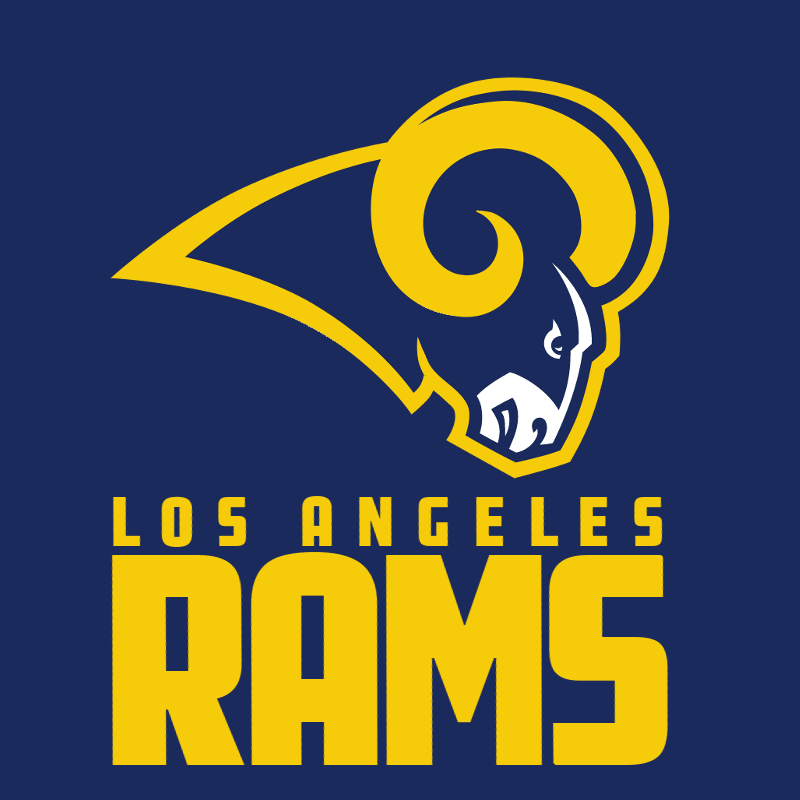 I think the Rams have a pretty good logo, so I just recolored it and updated the old LA wordmark. 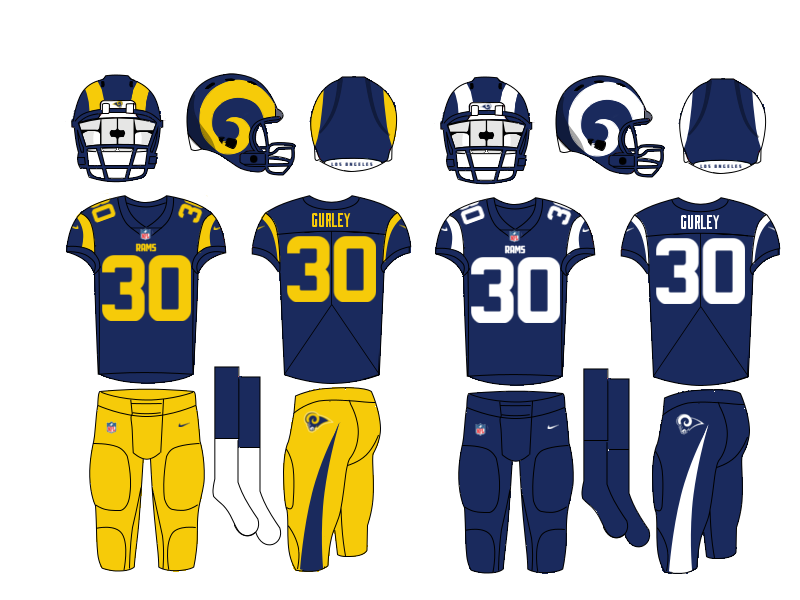 I love the idea of a yellow home jersey for the Rams in the California sunlight and it would be a unique look in the NFL. 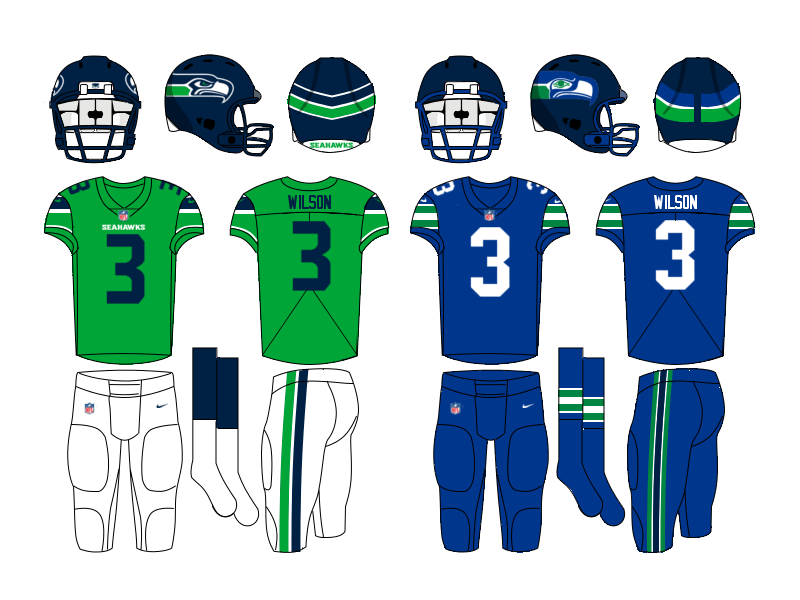 The alternate jersey is just an inverse of the home jersey and is paired with yellow pants. The Color Rush uniform is based on the old Deacon Jones blue and white look. I think its a sharp look, but it just isn't as good as deep royal blue and yellow. Well, that's it, pretty simple and to the point, but that's all it needs to be. Thanks for having a look. I can barely tell the difference between the pewter and red in the Bucs uniforms. Maybe you're colorblind, seriously. Those two colors might look similar if you are. Oh well okay then. 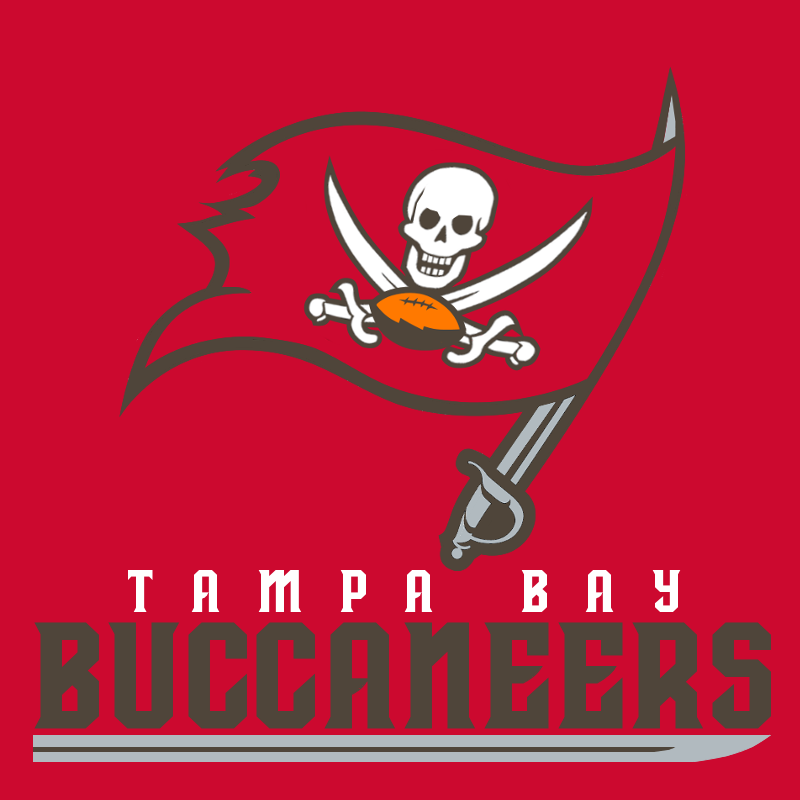 Just curious, do the Bucs colors always look like that to you or just for that concept? I used the current red but the pewter is closer to the old swatch.